Learn about how to protect your lawn during the winter months from destructive funguses like snow mold. The cold is finally starting to settle in! While it’s true that we have had an uncharacteristically warm winter so far, the chilly winter temperatures are starting to finally creep into our daily routines. When warm weather ends you might be tempted to throw that lawn mower in the shed and not think about caring for your lawn in the months ahead, but that is no way to keep your lawn safe against the elements and ready for year-long health. 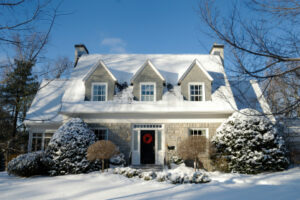 Keep your lawn as healthy as possible as we get ready for the colder months with the following winter lawn care tips. Winter is a great time to show your trees some extra love. Pruning your trees refers to removing dead, damaged and diseased branches. This should normally be done as soon as you take notice, but the best time to prune your trees in in late winter, early spring or just before the tree opens its buds. Learn how to properly prune your trees here. Winterize your lawn mower by emptying the gas tank, disconnecting the spark plug, taking out the mower blade, draining the oil, cleaning the undercarriage, changing the air filter and replacing the spark plug. Maintaining a properly functioning mower with sharp blades year-round is essential for the overall health of your lawn because it can prevent diseases and weeds from growing. Surprisingly, snow mold is something that many people don’t consider when winter weather begins to strike. Snow mold is a fungus that develops in cold, moist weather and generally damages or kills grass after snow melts. This growth begins in the winter and symptoms first appear when snow melts in the spring (in the form of circular, straw colored patches of snow). Thankfully, this fungus can be treated with a special fungicide. It’s easy to get overwhelmed with your day to day living while trying to maintain your home’s landscaping. The Atlantic Maintenance Group is here to help. We offer a wide variety of maintenance, landscaping, and general contracting services. To get your free quote today, give us a call at 410-768-4720 or contact us via our website today. You can also follow us on Facebook, Twitter, Pinterest, and Google+ to see how we’re growing! This entry was posted on Sunday, December 20th, 2015	at 11:58 pm	and is filed under Lawn Tips	. You can follow any responses to this entry through the RSS 2.0	feed. Both comments and pings are currently closed.